I feel like this is a case where two separate programs of the elite are interfering with each other. On one hand you have a concerted effort to make people apathetic while they are robbing us blind. On the other hand they want a spy network and people to rat on each other to protect their exit, except now the people are too apathetic to rat with out monetary or life preserving incentive. I fear if people were to rat on others, as in the case of the crossbow guy, the hammer would in fact come down, as it did with the ‘seize your house’ comments. The state must be vague and use the word ‘suspicious’ as to continue to not look like a police state. 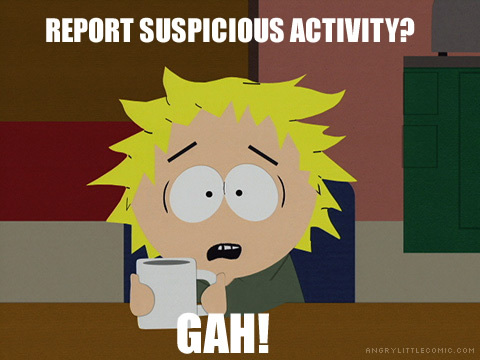 Replace ‘suspicious activity’ with ‘gypsy activity’ and viola you have Nazi Germany. If they had stated ‘report tea-party activity’ or ‘report people flying the gadsden flag for a $100 walmart gift card,’ we would be in an all out revolution. They are tip toeing that line rather gracefully, but that line is still there and I am still surprised the proverbial ‘first shot’ has still yet to happen. No fear. We have superior numbers. My only fear, is rather egocentric, that our numbers mostly consist of ‘falls on grenade’ skill set, I am the first one to get ratted out, sent to a FEMA Camp and no one to comes to my rescue. Our numbers are far more geeky than what we get credit for. I’d say the majority of people who work with computers and technology in some way are active or are sympathetic and would turn a blind eye. Look at any protest videos and you will see that what you are talking about is the response strategy… grab the leaders and stuff them in police vans, demoralize the protesters ranks. The ranks are still far superior and could easily break through and take their guy back and then some if they would just stuff the fear that’s being foisted on them as a means of control… that’s my argument.